admiration of the people generally. In brief, she was her own worst enemy. 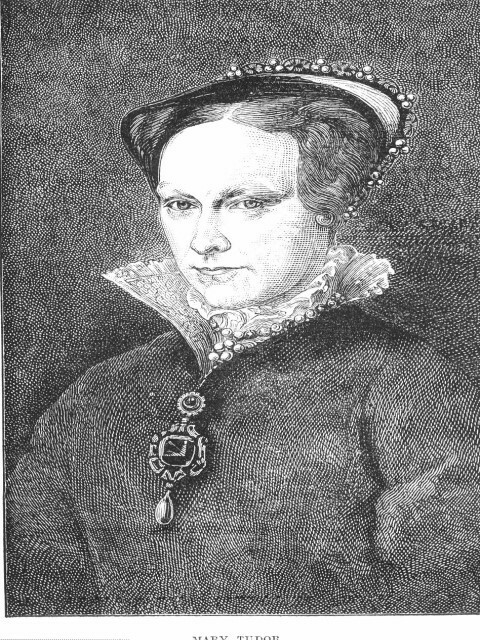 On hearing of her brother`s death Mary immediately wrote ( 9 July 1553) to the Lords of the Council claiming her right to the crown. They in turn replied on 9 July reiterating her illegitimacy. Mary left London on receipt of the rejection and went to Framlingham Castle, Suffolk. Here she stirred up the local populace who disliked the Duke of Northumberland for having suppressed a rebellion in Suffolk during Henry VIII`s time. Their help was offered on the understanding that she would not alter the religion then established by Edward. She lied to them. Thus she was well prepared to take arms against the Duke of Northumberland who was despatched after her, and overcame him. Meanwhile popular support for Mary in London resulted in them declaring for her. On 3 August 1553 she made a triumphant entry. Shortly after the blood began to pour beginning with the Duke of Northumberland who was promised a pardon if he recanted his faith, which he did. But was executed anyway. With him were Sir John Gates and Sir Thomas Palmer. reappearance of all things Popish in the churches. was to specifically exclude her from the succession because of her religion. Bradford, Ridley, Latimer, and Cranmer. against the Church of england is shown in her imprisonment of the archbishops Cranmer (Canterbury), Holgate (York); Bishops – Ridley, Poinet, Scory, Coverdale, Taylor, Hervey, Bird, Bush, Hooper, Ferrar and Barlow. Some twelve thousand clergymen were silenced and many of them imprisoned. barely seventeen years old,was beheaded along with her husband, Lord Guildford. Several other members of the nobility followed her to the block. On the 24th February the odious Bishop William Bonner issued instructions to take the names of parishioners who did not attend confession. The persecution had begun. She followed this with a Proclamation to force `foreigners` to leave the kingdom. This had the result of many learned teachers and professors at the universities having to leave. had been cast into the Tower. In this way the country and its people, of all persuasions and rank, were sold into slavery. set aside the succession of Elizabeth to the throne. This generated considerable expressions of concern, both for and against the possibility of a catholic heir; and an act of parliament for Queen Mary`s Issue. There followed a great many prayers thrown up by the clergy with injunctions to the people to do the same. Pope issued a bull that delivered instant excommunication to those who would not yield. But it was not put into action by the prelates because they feared retaliation. Catholic heir, arose concerning the birth of a son to King James II over a century later. were whipped , sixteen perished in prison, twelve were buried in dung hills. Is it any wonder that John Knox wrote The First Blast of the Trumpet against the Monstrous Regiment of Women intending it to be against the likes of “Bloody” Mary.